The CIA’s Role in the Anthrax Mailings: Could Our Spies be Agents for Military-Industrial Sabotage, Terrorism, and Even Population Control? On October 1, 2001-approximately two weeks before the first publicly announced anthrax mailing-Federal Bureau of Investigation (FBI) officials received an urgent warning from this author. (1) Government investigators were directed to consider the growing anthrax fright as the planned response to military-style propaganda. The American news media’s coverage of anthrax, and subsequently the anthrax mailings, held many similarities to what military officials in previous years called psychological operations (PSYOPs) for command and control warfare (C2W). The primary objectives in this unique anthrax campaign appeared to be pharmaceuticals sales and forced “emergency” legislation effecting stringent population controls. Due to the panic and official endorsements, Cipro sales skyrocketed more than 1000%. At a single consumer prescription cost of $700 for a mere sixty-day supply, the resulting revenue helped rescue Bayer from the brink of bankruptcy. (3) Then, Department of Health and Human Services (HHS) Secretary Tommy Thompson rushed to spend millions more on a “special” Cipro contract in further defense of the nation’s health. (4) By November, in the wake of the anthrax mailings, more than 30,000 panicked people in the United States were taking Cipro. (5) Unreported by the media was the grave likelihood that given Cipro’s myriad side effects, and largely untested status, more people had died from taking the drug than the handful who had succumbed from the anthrax mailings. Meanwhile, the deadly mailings-a form of serial homicide-had seemingly stumped our nation’s most adroit sluths. From my perspective as a Harvard-trained behavioral scientist and public health authority with special expertise in media persuasion technologies, this apparent military-industrial PSYOPs was so obvious I felt compelled to report it to the FBI. It was, after all, my constitutional duty as an American citizen and public health professional to do so. This article relays additional evidence that these criminal offenses are best explained by a relatively new treasonous form of military-industrial sabotage and terrorism in support of population control approaching economic genocide in support of the political pursuits of globalization. This conclusion is supported by massive evidence compiled in the prophetically titled book Death in the Air: Globalism, Terrorism and Toxic Warfare (Tetrahedron, LLC, 2001; 1-888-508-4787) that preceded the horrible events of September 11, 2001, along with the public access reports cited herein. While introducing a definitive 20-page referenced report on the anthrax mailings on December 10, 2001, that eventually reached close to 500,000 readers through the Internet, I wrote that “amazingly, despite generally perceived limitations on freedom of the press, enough truths are still told today to allow determined investigators and journalists to piece little known facts together to reflect broad, sociopolitical criminal realities.” At that time I was unaware that in the days following that report several mainstream newspapers, including the Baltimore Sun, New York Times, and Washington Post, would be following my leads and additionally supporting my conclusions with the testimonies of many anonymous experts and officials who, like me, felt compelled to relay urgent truths in defense of the American people. The following report provides important background on the suspects implicated in the anthrax mailings. 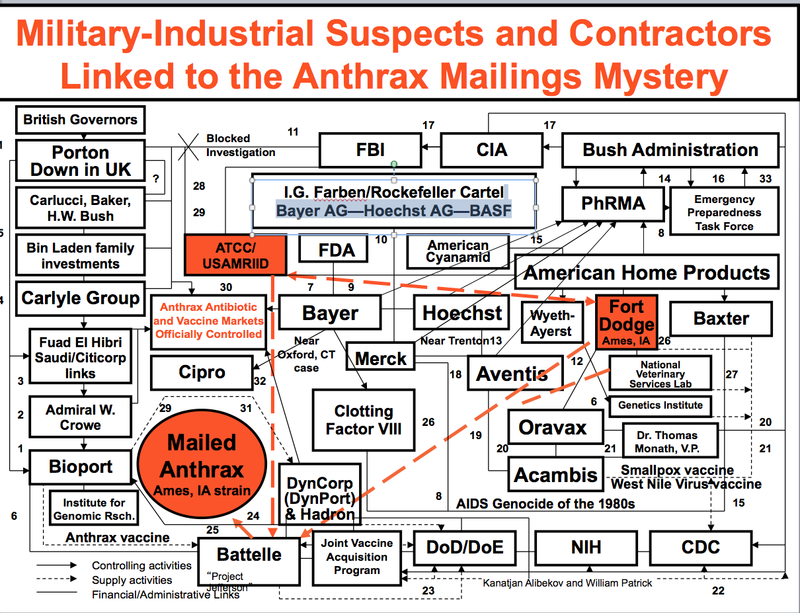 As with every official FBI investigation of suspects in serial slayings, a review of the developmental histories of chief suspects was conducted while considering military-industrial sabotage and terrorism as a possible motive for the crime of sending anthrax through the mail. From this knowledge, chief suspects were identified, and a determination of the primary, if not sole, source of the mailed anthrax was made. The evidence strongly suggests a conspiracy to commit military-industrial sabotage, terrorism, and treason against America involving anthrax developers at the Battelle Memorial Institute and collaborating agents within the Central Intelligence Agency (CIA) and/or national security system. Indeed, these scholarly assessments foreshadowed today’s news headlines concerning the official origin of the mailed anthrax-reports that seriously implicate military defense contractors, if not government officials themselves. What many may wish to believe is an appropriate National Security response to threatened bioterrorist attacks, is best explained by the words on the back of every dollar bill-“Novo Ordo Seclorum.” Without entertaining broad conspiracy theories, current events demonstrate a “New World Order” is certainly evolving from militarily managed chaos. Most people affected by this apparent mass-mediated military-industrial PSYOPs cannot fathom a conspiracy of this extent or nature. The accompanying diagram may help those who wish to help themselves to a most rational explanation of the anthrax mailings and related outcomes. I composed this flow chart to accompany my special report to the FBI and the mass media. It depicts the relationships between the chief military-industrial suspects, and is best reviewed in sequence according to the following numbered text. This flow chart evidences the organizational dynamics upon which a relatively broad anthrax mailings conspiracy was apparently effected. Again, the following numbered text items, corresponding to the numbers provided on the flow chart, provides information evidencing a military-industrial conspiracy to commit sabotage through the U.S. mail. In this way, media coverage and terrorism was effected in support of economic agendas and political concessions, including highly restrictive legislation, that has grossly compromised the civil rights of every American. According to some investigators,(16) additional Bioport shares were believed to be held by The Carlyle Management Group-America’s 11th leading defense contractor largely directed by past CIA director Frank Carlucci, James Baker III, George H.W. Bush, and former British Prime Minister John Major. 7. In July 2000, Germany’s Bayer AG negotiated an unprecedented sole endorsement by the FDA of the antibiotic Cipro for anthrax, despite the drug’s high risk, high price, and largely untested status. (7) Shortly thereafter, USA Today reported a study of conflicting interests on the FDA advisory committees endorsing drug policies. Author Dennis Cauchon wrote that between January 1, 1998 and June 30, 2000, during 92% of the 159 meetings, “at least one member had a financial conflict of interest. At 55% of meetings, half or more of the FDA advisers had conflicts of intrest. Conflicts were most frequent at the 57 meetings when broader issues were discussed: 92% of members had conflicts. At the 102 meetings dealing with the fate of a specific drug, 33% of the experts had a financial conflict.”(20) Given this background, it is most reasonable to speculate that the FDA’s unprecedented sole antibiotic endorsement of Bayer’s largely untested and outrageously expensive Cipro for anthrax likewise reflected special and grossly conflicting of financial interest. (Photograph reprinted from http://www.nrel.gov/surviving_disaster/fema2000/Cbiac/sld016.htm. Subsequently removed, but re-published by the author below. “One should not increase, beyond what is necessary, the number of entities required to explain anything,” urged William of Occam in providing his “Razor” analysis. This report seeks to do the same by simplifying the correlates and antecedents to serial homicide in the anthrax mailing mystery. This analysis is based on the FBI’s official model of analyzing suspects’ developmental histories and potential motives in such cases. The foregoing analysis recognizes the highly unsavory developmental histories of central suspects in this case-those who stood to gain most by the extensive news coverage of the anthrax crimes-investors in pharmaceutical and vaccine firms. In conclusion, this report characterizes the unique U.S. military weapons grade of anthrax developed from the Ames, Iowa strain that was used in the mailings and the organization most capable of making and distributing it. Given several incriminating associations and documented testimonies published in reputable periodicals, this author, supported by evidence advanced by Christopher Williams, was the first to determine the logical origin of this extraordinarily deadly form of aerosolizable anthrax-the Battelle Memorial Institute. This allegedly nonprofit multi-national military technology leader employed affiliated anthrax experts additionally linked to the CIA and implicated drug and vaccine companies. Although several contractors are under suspicion for what might best be called “military-industrial sabotage, terrorism, and serial homicide” the accompanying flow chart depicts the primary suspects are linked to the high levels within the CIA, the Bush administration, and the British government. All of these powers operate with little to no effective judicial oversight. This, then, is the likeliest explanation as to why the FBI’s investigation has been slow and inconclusive. 1) Who in the Battelle Institute’s Jefferson labs had access to the optimally concentrated aerosolized, silica-based, Ames strain of anthrax, and who transported it to Trenton, New Jersey and elsewhere to be mailed? 2) Who in the CIA was assigned to oversee or participate in this classified biological weapons, or bioterrorism, “defense” operation, and who, if anyone in the agency (as with Battelle personnel), had the wherewithal and matching itinerary to effect the anthrax mailings in Trenton, St. Petersburg, Atlanta, and Malaysia. 3) Who at Battelle coordinated the Joint Vaccine Acquisition Program, and might they have held conflicting interests in the company (Bioport or companies) that stood to gain most financially by the acquired vaccines and/or anthrax fright. 5) Who in the FBI received and carried out these suppressive orders, and what role, if any, did they play in stalling or misdirecting the anthrax mailings investigation. 6) Is America at risk and under attack from within our own secretive national security system, possibly more than it is from foreign entities and terrorist groups? 7) Could British agents, agencies and companies be involved with Bush administration officials and the CIA in directing a virtual coop in the United States in keeping with neo-colonialism, globalization, and related geopolitical agendas? Copyright © 2001 by Leonard G. Horowitz. 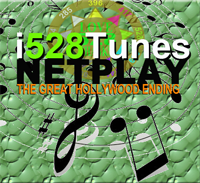 All rights reserved though may be recopied, distributed, or posted on the worldwide web for non-profit purposes only. For more information visit: http://web.archive.org/web/20021202071714/http://www.tetrahedron.org/. * Leonard G. Horowitz, D.M.D., M.A., M.P.H. is a Harvard trained expert in public health and the social and behavioral sciences. This work is dedicated to the recently deceased Professor Don C. Wiley of Harvard whose case remains another solvable mystery. Dr. Horowitz may be contacted through Tetrahedron, LLC. For additional writings on this subject by Dr. Horowitz, read Death in the Air: Globalism, Terrorism and Toxic Warfare (Tetrahedron, LLC, June 2001; $29.95; 1-888-508-4787, available from http://web.archive.org/web/20021202071714/http://www.deathintheair.com/ and http://web.archive.org/web/20021202071714/http://www.tetrahedron.org/ ). For Dr. Horowitz’s speaking schedule and services call 1-800-336-9266. 1) Tetrahedron, LLC. Bioterrorism author urges new FBI investigation. Media Bypass 2001 (December);9;12:54-61. See also: http://web.archive.org/web/20021202071714/http://www.tetrahedron.org/articles/anthrax/letter_to_fbi.html. 2) The CDC advanced legislative proposal is available for downloading from: http://web.archive.org/web/20021202071714/http://www.publichealthlaw.net/MSEHPA/MSEHPA.pdf. 3) McHugh D. Bayer posts $165 million Q3 loss. Associated Press Business News. Wednesday, Nov 14, 2001. Available from: http://web.archive.org/web/20021202071714/http://news.excite.com/news/ap/011114/08/germany-bayer. 4) Bradsher K. Bayer agrees to charge government a lower price for anthrax medicine. New York Times, October 25, 2001. Available from: http://web.archive.org/web/20021202071714/http://www.nytimes.com/2001/10/25/business/25BaYE.html. 5) Miller J and Johnston D. Investigators liken anthrax in leahy letter to that sent to Dasche. New York Times, November 20, 2001. Available at: http://web.archive.org/web/20021202071714/http://www.nytimes.com/2001/11/20/politics/201NQU.html?todaysheadlines. 6) Horowitz LG. Deadly Innocence: The Kimberly Bergalis Case-Solving the Greatest Murder Mystery in the Annals of American Medicine. Tetrahedron, LLC Press, 1993. See also: Horowitz LG. Murder and cover-up could explain the Florida dental AIDS mystery. 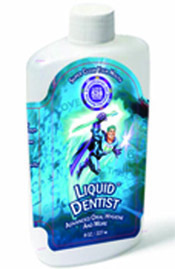 British Dental Journal. 1994 10;24:423-327; This report was based on: Hartman AW, Ressler RR, Douglas JE and McCormack A. Sexual homicide: a motivational model. In: Criminal Investigatory Analysis of Sexual Homicide. National Center for the Analysis of Violent Crime, United States Department of Justice, Federal Bureau of Investigation, pp. 39-60, 1990. 7) O’Meara K. Drug deal: Investigative report. Washington Times, Insight Magazine. November 26, 2001, pp. 24-25. 8) Broad WJ. Terror anthrax lined to type made by U.S. New York Times. December 3, 2001. Available at http://web.archive.org/web/20021202071714/http://www.nytimes.com/2001/12/03/national/03POWD.html ; See also: Broad W. and Miller J. Anthrax inquiry looks at U.S. labs. New York Times, December 2, 2001. Available at: http://web.archive.org/web/20021202071714/http://www.nytimes.com/2001/12/02/national/02POWD.html. 10) Horowitz LG. Death in the Air: Globalism, Terrorism and Toxic Warfare. Sandpoint, ID: Tetrahedron, LLC, 2001, pp. 304-308; for Richard Preston’s propaganda concerning the West Nile Virus outbreak, see pp. 1-13; for Dr. Monath’s meeting with Jerry Hauer and Clinton administration officials at the White House, see pp. 105-109. 11) Begich N and Burke K. New non-lethal weapons systems may be used against U.S. citizens. Report presented to the World Foundation for Natural Sciences on October 17, 1998, Interlaken, Switzerland. Published by The Leading Edge. Available from http://web.archive.org/web/20021202071714/http://www.earthpulse.com/. 13) Bioport was originally purchased by majority shareholder Intervac, a Maryland-based biotech firm owned by Admiral William J. Crowem Jr., but purchased by Fuad El Hibri, the general manager of Intervac. Mr. El Hibri directed the buyout as he had previously done with Porton Products Ltd., a Cambridge, England company apparently linked to Porton Down, England’s top biological weapons development and testing facility. (See: U.S. Government Reform Subcommittee on National Security, Veterans Affairs, and International Relations. June 30, 1999, available from http://web.archive.org/web/20021202071714/http://www.freerepublic.com/forum/a3b12516e4594.htm ; See also: http://search.lycos.com/main/default.asp ?lpv=1&loc–searchhp3&query=Faud+El-Hibri&… [see #10-Lansing State Journal]. In August 2001, the BBC reported that 20,000 “so called human guinea pigs went to Porton Down between 1939 and the 1960s” for various illegal chemical and biological weapons tests. Thousands were harmed or killed as a result. See: http://web.archive.org/web/20021202071714/http://news.bbc.co.uk/low/english/uk/newsid_1506000/1506968.stm. For Robert Myers, Battelle Memorial Institute and the DoD’s Joint Vaccine Acquisition Program data see: Myers RC. Chief Operating Officer and Director, BioPort Corporation, The a joint meeting of the Senate Veterans Affairs Committee and the Subcommittee on Labor, Health and Human Services, Education and Related Agencies of the Senate Appropriations Committee, March 16, 1999. Available from: http://web.archive.org/web/20021202071714/http://www.senate.gov/~appropriations/old/labor/myrs3_16.htm. 15) Irvine R and Kincaid C. Another leftover scandal from Clinton: Background of Anthrax vaccine manufacturer BioPort. Free Republic. May 22, 2001. Available from: http://web.archive.org/web/20021202071714/http://freerepublic.com/forum/a3b12516e4594.htm. 16) Skolnick SH. Overthrow of the American republic: The anthrax commissars. Citizen’s Committee to Clean Up the Courts. The primary source wished to remain anonymous. Mr. Skolnick relayed to this author by direct communication that he personally interviewed the source. For more information contact: Sherman H. Skolnick, 9800 South Oglesby Avenue, Chicago, IL 60617-4870. (773) 375-5741; E-mail skolnick@ameritech.net; See also Menchken HL. The great anthrax stock swindle. Available from: http://web.archive.org/web/20021202071714/http://www.whatareweswallowing.freeserve.co.uk/anthrax.htm. 18) Gurney I. US anthrax vaccine manufacturer Bioport and bin Laden. December 19, 2001. Available from: http://web.archive.org/web/20021202071714/http://www.caspro.com/. 20) Cauchon D. FDA advisers tied to industry. USA Today, Oct 1, 2000. Available from: http://web.archive.org/web/20021202071714/http://www.nytimes.com/2001/12/20/national/20VACC.html?todaysheadlines. 21) Massie RK. Blood feud: A mother takes the hemophilia tragedy to court. New Yorker. June 16, 1997, pp. 98-102. 22) Manning P. Martin Bormann: Nazi in Exile. Secaucus, NJ: Lyle Stuart, Inc., 1981. 23) Borkin J. The Crime and Punishment of I.G. Farben: The Unholy Alliance Between Hitler and the Great Chemical Combine. New York: Barnes & Noble, 1997. 24) Griffin GE. World Without Cancer: The Story of Vitamin B17. Westlake, CA: American Media, 1997. 29) Horowitz LG and Martin WJ. Emerging Viruses: AIDS & Ebola-Nature, Accident or Intentional? Tetrahedron, LLC, 1998, pp. 37-38; for Lederle Labs connection to polio vaccine contaminations see p. 492; for CIA stockpiling of anthrax see document on p. 278; for expose’ on Richard Preston as a bioterror propagandist see pp. 385-400. 30) Manning P. op cit., pp. 29 and 56. 32) Staff. Industry role in bioterrorism response planning must be open to the public. The Public Citizen, Nov. 8, 2001. Available from: http://web.archive.org/web/20021202071714/http://www.citizen.org/pressroom/release.cfm?ID=901; See also: Claybrook J. Drug companies wage war on consumer. The Public Citizen, Nov. 30, 2001. Available at: http://web.archive.org/web/20021202071714/http://www.citizen.org/pressroom/release.cfm?ID=953. 33) Palast G and Pallister D. FBI and US spy agents say Bush spiked bin Laden probes before 11 September. The Guardian (London). November 7, 2001. Available from: http://web.archive.org/web/20021202071714/http://www.citizen.org/pressroom/release.cfm?ID=953.27. 35) The reference for the Hoechst-Rhone Poulenc’s Aventis (Merck partnered) and Acambis “strategic alliance” with AHP’s Baxter Healthcare Corporation to produce the smallpox vaccine is available at http://web.archive.org/web/20021202071714/http://www.biotechshares.com/acambis.htm. 37) Broad W and Miller J. Germ defense plan in peril as its flaws are revealed. New York Times, August. 7, 1998. 38) Battelle’s nuclear biological and chemical group is described on their website at: http://web.archive.org/web/20021202071714/http://www.nbcindustrygroup.com/battel.htm. 39) Battelle’s West Jefferson, Ohio BL-3 laboratory may be viewed at: http://web.archive.org/web/20021202071714/http://www.oravax.com/. 42) Preston R. Annals of Warfare-The Bioweaponeers. New Yorker, March 9, 1998. 43) To access this slide click on: at http://web.archive.org/web/20021202071714/http://www.nrel.gov/surviving_disaster/fema2000/Cbiac/sld016.htm. 45) Schmidt S and Warrick J. FBI investigates possible financial motive in anthrax attacks. Washington Post, Friday, December 21, 2001, pg. A21. 48) National Veterinary Services Laboratory (NVSL) general description is available from: http://web.archive.org/web/20021202071714/http://www.aphis.usda.gov/mds/eng-nvsl.html. 50) Broad WJ, Johnston D, Miller J and Zielbauer P. Experts see F.B.I. missteps hampering anthrax inquiry. New York Times, November 9, 2001 http://web.archive.org/web/20021202071714/http://www.nytimes.com/2001/11/09/national/09INQUI.html?pagewanted=1&todaysheadlines. 53) McHugh D. Bayer posts $165 million Q3 loss. Associated Press. November 14, 2001. Available from: http://web.archive.org/web/20021202071714/http://www.news.excite.com/news/ap/011114/08/germany-bayer. 54) Denny C. Rules relaxed in rush for new smallpox vaccine. The Guardian, Thursday, October 25, 2001. 56) Abelson R and Pollack A. Other drugs to combat anthrax are in ample supply. October 23, 2001. New York Times. 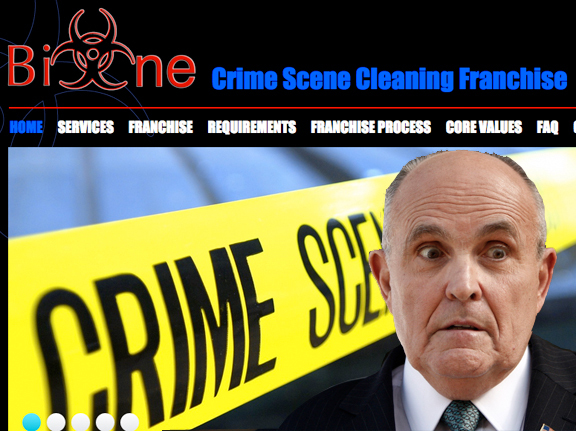 Available at: http://web.archive.org/web/20021202071714/http://www.nytimes.com/2001/10/23/business/23DRUG.html; See also: Pear R. In anthrax crisis, health secretary finds unsteady going. New York Times, October 25, 2001. Available from http://web.archive.org/web/20021202071714/http://www.nytimes.com/2001/10/25/national/25THOM.html; See also: Bradsher K. New York Times, Oct. 25, 2001. Other antibiotics than Cipro. 57) Stolberg SG. Senators seek $3.2 billion to fight germ threats, doubling bush plan. New York Times, Nov. 16, 2001. Available from: http://web.archive.org/web/20021202071714/http://www.nytimes.com/2001/10/25/business/25BAYE.html. 58) Wade N. A nation challenged: Drug research; U.S. hunting antiviral drug to use in case of smallpox. New York Times, November 23, 2001. Available from NYTimes online archives. 59) Horowitz LG. Polio, Hepatitis B and AIDS: An integrative theory on a possible vaccine induced pandemic. J Medical Hypothesis 2001;56;5:677-686. 60) Scott S. Anthrax matches Army spores (identical to Dugway PG, Ft Detrick anthrax). Baltimore Sun, Dec. 12, 2001. p. 1. 61) Dresch SP. Investigation into responsibility for recent anthrax incidents: A report to the Honorable Henry J. Hyde, Chairman of the Committee on International Relations, U.S. House of Representatives, December 10, 2001. For copies of this report contact the Forensic Intelligence International, LLC, the Kauth house, 318 Cooper Avenue, Hancock, MI 49930, or e-mail: sdresch@forensic-intelligence.org. 62) Begich N and Horowitz L. Lethal revolution in unpopular non-lethal warfare. In: Chapter 15, “Non-lethal Electromagnetic Weapons” of Death in the Air: Globalism, Terrorism and Toxic Warfare. L. Horowitz, ed. Sandpoint, ID: Tetrahedron, LLC, 2001, pp. 306-307. In a process similar to Haydon-Baillie’s creation of Porton International, Dr. Dresch continued, “Fuad El-Hibri and Admiral William J. Crowe, Jr., who had just returned from a posting as ambassador to the United Kingdom, created Bioport Corporation, which acquired the State of Michigan’s Biological Products Laboratory,” the sole producer of the anthrax vaccine for the U.S. military. 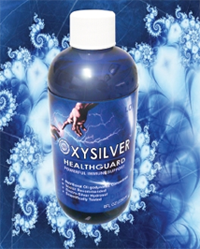 The “highly questionable privatization” of this laboratory had been the subject of numerous reports in the mainstream and alternative press, particularly following the government’s expressed intention to vaccinate the entire military with this non-FDA approved, largely untested, broadly ineffective, immunologically weak, and highly risky anthrax preventive. Relating Bioport and its British principles at Porton Down to the mysteriously deceased Larry C. Ford, M.D., and Vladimir Pasechnik, Dr. Dresch provided telling text. He wrote that in early March 2000, at his home in Irvine, Orange County, California, Dr. Ford “died of a shotgun blast. His death was later ruled a suicide, notwithstanding the fact that his firearms had supposedly been confiscated by the police several days before, after the attempted murder of his business partner, a crime for which he was a principal suspect. Only later was it revealed that Ford had served as a consultant to both the CIA and the chemical and biological weapons program of the South African Defense Forces, headed by Wouter Basson, M.D. The Dresch report also contained stinging insights into the criminal behavior and associations of Dr. Basson, who “headed the South African biowarfare program from its inception in the late 1970s until it was nominally abandoned in 1993.” Dr. Dresch reported that Basson had been arrested in 1997 on charges of murder, embezzlement and drug violations. Basson’s trial began in 1999 and remains ongoing at the time of this writing. His legal records detailed a spider’s web of offshore business investments and relationships between Basson and the organizations chiefly suspected in the anthrax mailings. He claimed to have “enjoyed access to the U.S. Army Medical Research Institute for Infectious Diseases [USAMRIID] and Porton Down. The Washington Post (Sunday, December 16, 2001) reported that USAMRIID was a main supplier of the Ames strain of anthrax distributed to all the biological weapons labs allegedly being investigated by the FBI, including Dugway Proving Grounds and the Battelle Memorial Institute (BMI). 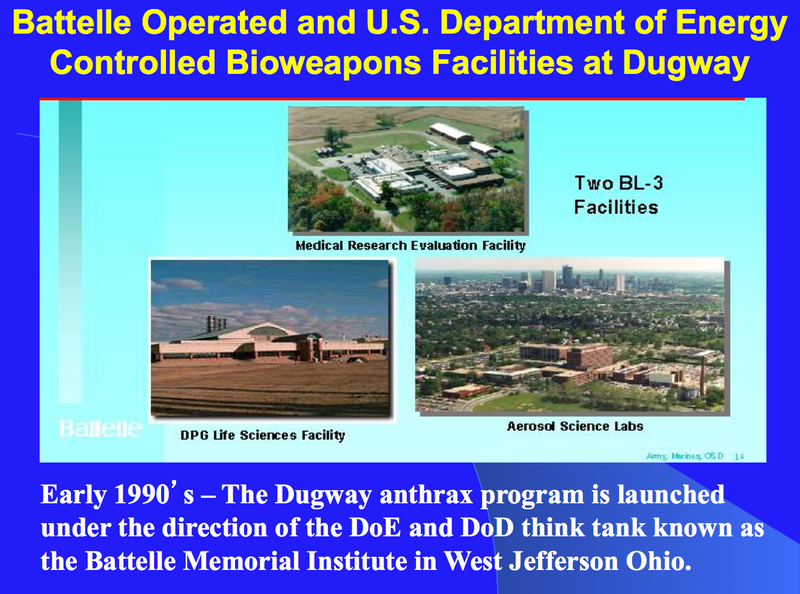 USAMRIID and Dugway testing labs were reported on December 12, 2001 as testing a strain of anthrax powder virtually identical to the one that was mailed. (60) The fact that Bioport (largely owned by Porton Down investors) and BMI were working in tandem to produce the anthrax vaccine, and Battelle supplied and administered Dugway’s aerosolized germ warfare facilities, links an arrested criminal accused of murder in 1997, to the labs that developed, tested, and stockpiled the mailed anthrax powder in 2001. Basson, Dr. Dresch added, had been involved in “several undertakings with Libyans and made numerous trips to Libya, continuing after his [South African biowarfare] program was terminated.” This led to “successful British and U.S. demands that he be reemployed, and controlled, by the South African government,” according to Dr. Dresch. Basson is suspected of being involved in the major anthrax outbreak in Rhodesia (currently Zimbabwe) in 1979 linked to the South African government, currently under investigation. Basson is also “alleged to have developed such means of delivery of biological agents as, for example, anthrax-laced cigarettes,” Dr. Dresch wrote. 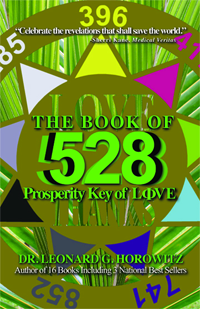 The “Mark of the Beast” referred to in the Bible-666 or SSS (using the alphanumerics of the multiples of six, wherein A=6, B=12, C=18 . . . S=114 . . . Z=156; adjusted to the single digit Pythagorean integer [e.g., S=114 or 1+1+4 = 6])-is likewise reflected on every bar code, the VISA insignia, NATO’s supercomputer in Brussels, Belgium, the sum of the word “VACCINATION,” and the logo of the Atomic Energy Commission directed and Department of Energy managed nuclear engineering laboratory adjacent the town of ARCO in southern Idaho. BMI is intimately involved in DoE administration, research, and developments involving nuclear energy, Navy sonar, weather, environmental, and population policy initiatives and technologies many of which involve research in the fields of genetics, electromagnetics, and frequency broadcasting. Given Battelle’s leadership in the fields of population sciences, climate control, personal identification, data storage and retrieval, electromagnetic surveillance technologies, biological and chemical warfare, and “defense” strategies including vaccinations, along with concurrent involvements with Bioport and other drug companies directing the government’s vaccine acquisitions program, some observers and civil rights advocates have expressed justifiable concern regarding the forced vaccinations required under the “Model State Emergency Health Powers Act.” Following a perceived smallpox outbreak, for instance, the possibility that “preventive” injections may carry identification and/or surveillance devices akin to the Bible’s “Mark of the Beast” is, unfortunately, very real.